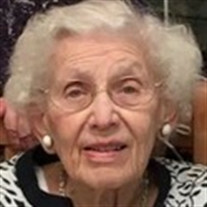 Obituary for Rosalie Halpert | Langeland Family Funeral Homes, Inc.
Rosalie Halpert passed away peacefully on Sunday, February 18, 2018, at her home in Woodside Village. She had 97 years of good health before multiple mini strokes took the last of her strength. Rosalie was born in South Bend, IN, on May 6, 1920 to Mary and Ely Zuravel. She had three siblings who proceeded her in death. Rosalie was fortunate to be first generation American. While she was growing up in South Bend, her cousins were living in caves in the Ukraine hiding from the Nazis. A documentary (No Place on Earth) has been released honoring her family. After graduating from high school, Rosalie became a successful buyer in a large department store. When she was 22, she married her soul mate Sam and went off to Battle Creek MI to be an Army wife. The next step of her journey took her to a tiny town called Paw Paw MI where she spent the next 50 years. She and Sam opened a small hardware and appliance store, which was very successful. In 1946, Sherry blessed their lives followed by Rick 18 months later. Rosalie spent her time raising her children and helping with the business. Rosalie loved to sew. She enjoyed playing mahjong and bridge and entertaining friends and family. She took great pride in her home and was an excellent cook. She also loved to travel. She and Sam visited many countries abroad. She was an active member of the Congregation of Moses and its Sisterhood in Kalamazoo MI. Though her home was Paw Paw, her heart was in Kalamazoo. She spent many hours driving the 20 miles to be active in the Jewish community and insure that her children had a good Jewish education. When they retired, Sam and Rosalie moved to Kalamazoo and in 2008 to Woodside Village. Sam passed away in May 2008. Rosalie is survived by her son Rick (Mary); daughter Sherry; grandchildren Dave (Elise), Mike (Valerie), Emily; great grandchildren Ryan, Grace, RJ and many nieces and nephews. Though not without challenge or hardship, Rosalie had a good life, full of opportunity, friends, family, faith and love. For this, we are thankful. The family would like to extend their deepest gratitude to the staff at Woodside Village for caring so much about and for Rosalie. May she rest in peace. Private family services were held on Monday, February 19, 2018 with burial in Jewish Riverside Cemetery. In lieu of flowers, donations may be made to the Congregation of Moses, Hospice Care of Southwest Michigan.